Waking up this morning to find the first snow of the year on the ground. Not much, only a dusting, but enough to shine brightly through the darkness at 5:30 AM. Walking over to the studio, I was thinking about the snow scenes that I’ve been painting recently as a loose series. I normally only do these snow paintings once in a while but this series has felt great as I have been doing them, pulling me in immediately in the process. They have a mesmerizing effect that seems to come from the subtlety of the colors underlying the surface. 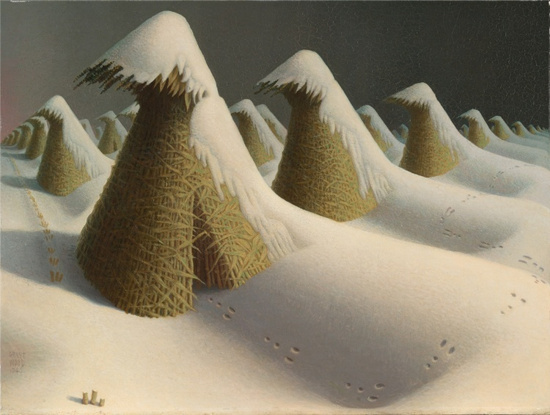 But today’s snow also reminded me of a couple of works from a favorite of mine, Grant Wood. 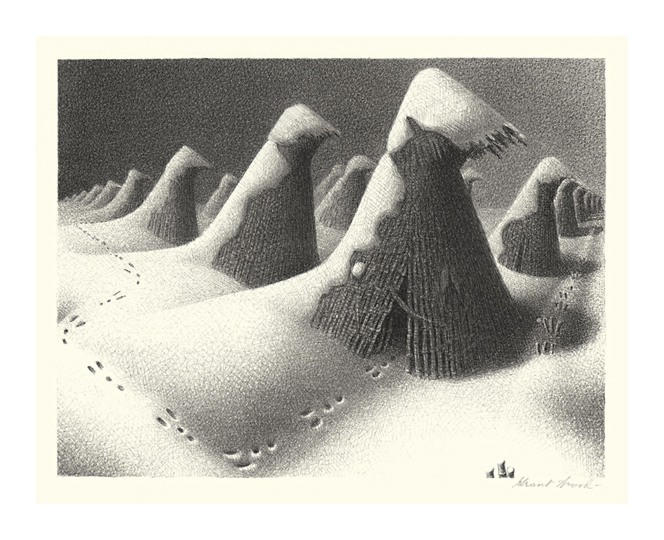 I thought I’d revisit an entry from back in 2011 where I wrote about his winter scenes. I added a couple more images along with a bit of music title Grant Wood from the Turtle Island String Quartet that pays tribute to the artist. Take a look and a listen then have yourself a good day. 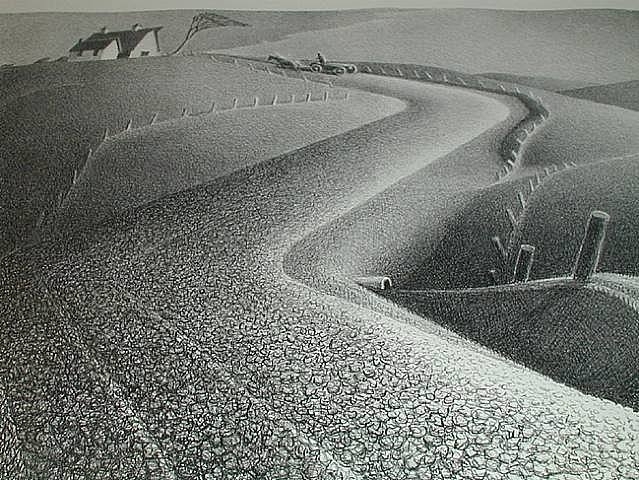 I’ve expressed my admiration here for the work of Grant Wood more than once. I find his imagery compelling, especially the way he creates mood and tension in what seem to be typical, mundane scenes. 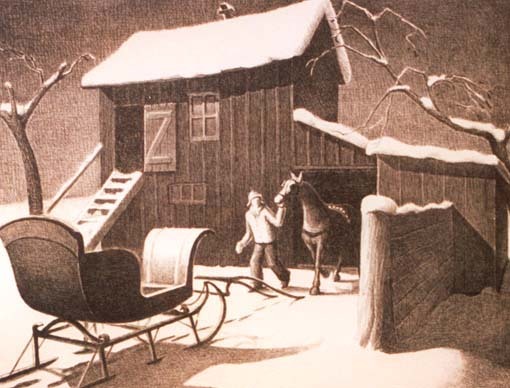 His paintings and lithographs often have a wonderful rhythm throughout them that sings to me. I see these qualities captured beautifully in a series of stone lithographs he created that capture the feeling of the winter months in quiet and moody tones. The subtle shifts in the grays of the ink recreate the seasonal sense of atmosphere, a point illustrated wonderfully in this piece shown above, January. 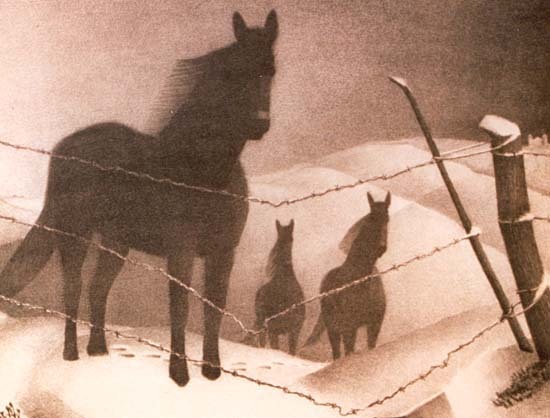 This print on the left, February, was completed in 1941 and has an ominous yet beautiful quality about it. I love the rhythm in its simple composition, from the patterned fields of the farm in the background to the placement of the dark figures of the horses to the three strands of barbed wire that cross the picture plane. The way the dark horse in the foreground plays off the graded darkness in the right of the sky. Just beautiful. Maybe the foreboding nature of this print was an omen of Wood’s own death from pancreatic cancer the very next February. He was born in February and died in February, one day short of his 51st birthday. I am staggered by the work Grant Wood created in his relatively short life and wonder what might have been had he lived to a ripe old age. I guess that doesn’t matter when he left such a rich legacy behind as it was.